Teddy bear hugs, Lego masterpieces, Barbie fashion shows and Monopoly triumphs. You may grow up, but you never forget your favorite childhood toys. How can play things from decades ago have such a powerful hold on our emotions? “Just as a certain smell or taste may evoke a certain feeling, a toy is able to do that,” Adrienne Appell, toy trend specialist and a spokeswoman for the Toy Industry Association, told TODAY Parents. As it celebrates the 100th anniversary of its founding on Thursday, the Toy Industry Association is looking back at some of the most popular and iconic toys of the past decades. The timeline is packed with favorites that kids still love today, Appell said. The 1930s brought Lego and Monopoly, for example. Barbie arrived in the 1950s. 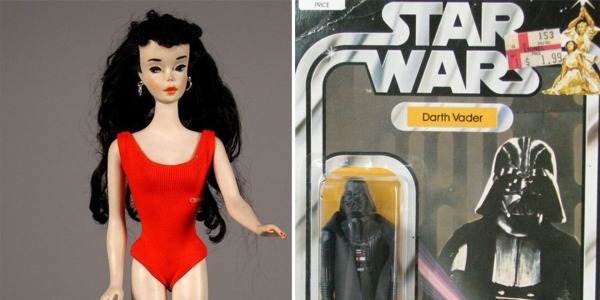 “Star Wars” action figures began their hold on children’s hearts in the 1970s. What’s striking is that playtime from 100 years ago isn’t that different from today. Kids still reach for dolls, stuffed animals, train sets and blocks. Digital screen now offer new temptations, but old favorites keep their charm. “As much as things have changed, a lot of it has stayed the same. You’re still going to be able to walk to toy stores and see a lot of these toys on the shelf: Lincoln Logs, Erector Sets, Raggedy Ann, Mickey Mouse,” Appell noted. With technology, there’s a whole breadth of toys that didn’t exist just a few years ago. And classic games such as Monopoly are adding modern twists — like a cashless version — to appeal to today’s children, Appell noted. You can find stuffed teddy bears alongside stuffed Angry Birds. Some toys endure for decades, thanks to parents who think back fondly to their own childhoods. Check out the full slideshow of 100 years of toys. Celebrate the 100th anniversary of the Toy Industry Association by looking back at some of the most iconic toys of past decades.